The D5s are compact, powered nearfields with sharp imaging and midrange clarity. Sharp imaging. Midrange detail. Compact size. Not such a bargain in the UK, compared to the US pricing. There are many choices when it comes to buying a set of nearfield monitors for your studio, like these Audio Research D5s, with many well-known names among them. "Equator has certainly gained respect for its Q series, which feature a coaxial design that allows the full range of audio to emanate from a single location "
Equator may not have been around long enough to be among those names yet, but the US company - formed in 2007 by Ted Keffalo, one of the co-founders of Event Electronics - has certainly gained respect for its Q series, which feature a coaxial design that allows the full range of audio to emanate from a single location by having the tweeter placed at the centre of the woofer. The advantage of a coaxial design, with sound emanating from a single point-source, is that it shouldn't exhibit the sort of midrange phase distortion that a traditional two-way monitor design can introduce when the audio, split at the crossover, collides when radiated from the separately located tweeter and woofer. The D5s are much smaller than the Q series but maintain the design aesthetic. What you're getting is a powered monitor, small enough to easily move from studio to studio if you wish, with a 1-inch silk tweeter centrally located in the 5.25-inch woofer and internal DSP. Equator believe that no two transducers have ever been manufactured with identical output characteristics and that, without the left and right speakers having the same characteristics, image shifts will occur in the stereo field. That's where some of the DSP comes in - to provide accurate voicing for each individual monitor by delivering a consistently matched output curve for every unit, that voicing being created, say Equator, by award-winning recording engineers, who referenced their hit mixes. Compact enough not to dominate your studio space, at first glance the D5s have the look of a two-way monitor until you realise that you're actually getting a tuned front port for bass that sits under the main driver assembly. A bright blue LED directly below shows when they're powered up. "Plenty loud enough if you want them to be, putting out 103dB, the D5s provide an impressively full sound for such a small box"
XLR and 1/4-inch TRS jack connections are on the rear panel, along with another socket that's for factory calibration only and there's a rear-panel three-way switch to optimise the monitors with different degrees of low-end roll-off for different room locations: corner, in front of a wall, or free standing. Setting the sensitivity (volume) for each monitor is done with a rotary knob, which is detented so you can accurately match a pair. Plenty loud enough if you want them to be, putting out 103dB, the D5s provide an impressively full sound for such a small box. The bass end, which the specs say goes down to 53Hz, is well-represented and gives you a pretty solid enough idea of what's going on down there to inspire confidence in your low-end mix decisions. The sound is well defined across the rest of the spectrum, too. 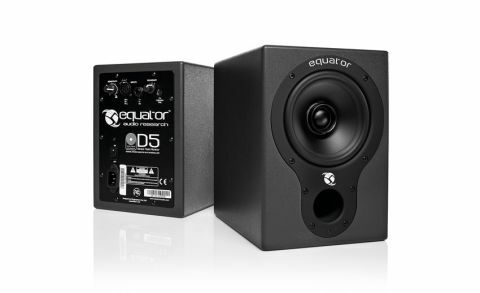 Equator's design ethic focuses mainly on the area of midrange detail from 900Hz-3kHz and, with the coaxial speakers combined with a steep 4th order crossover, they seem to have got things just right there in terms of clarity and a linear frequency response that can let you be really analytical. With DSP making sure that the two monitors are perfectly matched, imaging is particularly sharp. The overall impression is that the D5s deliver plenty of definition to let you hear exactly what you need to hear. Coming back to what we were saying at the start, there's plenty of choice in the nearfield monitor market but the D5s deserve to be in contention: they're really good performers that can hold their own against more expensive sets, although at nearly £350 a pair, they're not quite the bargain that they are in their native US, where they sell factory-direct for $299.